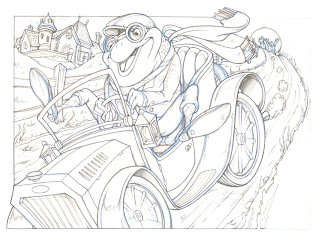 An image of Mr. Toad from The Wind in the Willows came to mind for the theme of cars. 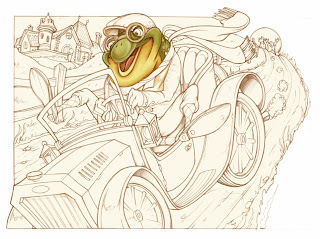 I want to experiment with a few things painting this Illustration. I won't get it done this week so I thought I would go ahead and post the drawing. If I finish it I'll post it later. I also have a color sketch started. So far it has been done in Painter with the Simple Water & Watercolor brushes. Great guns... this is marvelous. I really like what you've done with the face so far... are you doing that digitally, or gauche, maybe? Colored pencil?Fun stuff! Very cool, great idea and nicely done. 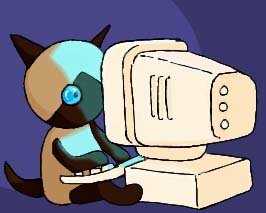 Hope you post the finished illo!